Danger and betrayal, love and loss, secrets and enchantment are woven together in the breathtaking finale to the #1 New York Times bestselling Infernal Devices Trilogy, prequel to the internationally bestselling Mortal Instruments series.THE INFERNAL DEVICES WILL NEVER STOP COMING A net of shadows begins to tighten around the Shadowhunters of the London Institute. Mortmain plans to use his Infernal Devices, an army of pitiless automatons, to destroy the Shadowhunters. He needs only one last item to complete his plan: he needs Tessa Gray. Charlotte Branwell, head of the London Institute, is desperate to find Mortmain before he strikes. But when Mortmain abducts Tessa, the boys who lay equal claim to her heart, Jem and Will, will do anything to save her. For though Tessa and Jem are now engaged, Will is as much in love with her as ever. As those who love Tessa rally to rescue her from Mortmain’s clutches, Tessa realizes that the only person who can save her is herself. But can a single girl, even one who can command the power of angels, face down an entire army? 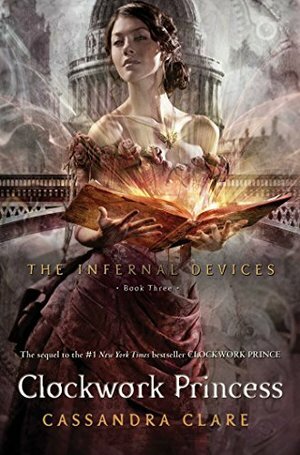 Danger and betrayal, secrets and enchantment, and the tangled threads of love and loss intertwine as the Shadowhunters are pushed to the very brink of destruction in the breathtaking conclusion to the Infernal Devices trilogy.